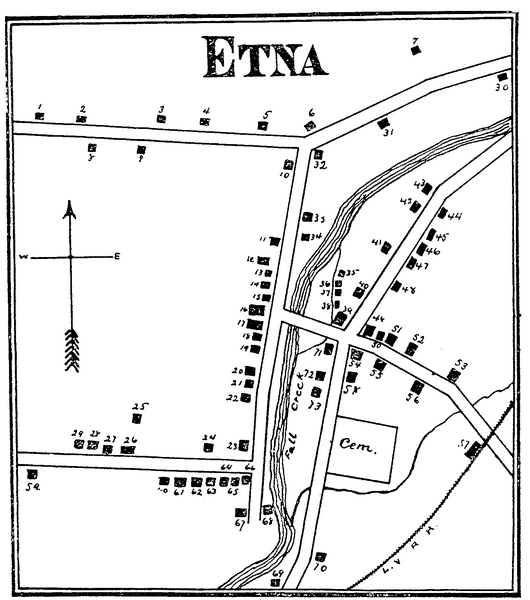 Key to the Map of Etna (1897) 1. Mrs. C. Turner. 38. Blacksmith Shop. 2. J. T. Primrose. 39. Houtz's Etna Roller Mills. 3. E. F. Weaver. 40. Store. 4. James Rawley. 41. Ai Van Horn. 5. Geo.Cowdrey. 42. Ann Merchant. 6. L. Dusenberry. 43. Geo. L. Snyder. 7. Arthur Burr. 44. Mrs. William Haskins. 8. Mrs. H. Ralph. 45. Ladrew Sherwood. 9. Mrs. D. Weaver. 46. Eli Conklin. 10. L. Freeman. 47. Wm. Tichenor. 11. Wm. Smith. 48. Store. 12. School House, No. 11. 49. Arthur Coggswell. 13. Shoe Shop. 50. Meat Market. 14. David Brotherton. 51. H. A. Root, Hotel. 15. Dr. G. L. Rood. 52. Geo H. Houtz. 16. Baptist Church. 53. Mrs. C. Houtz. 17. M.E. Church. 54. Geo. H. Houtz. 18. Wm. W. Sherwood. 55. W. Marsh. 19. Mrs. J. S. Weidman. 56. Etna Hotel, C. Westervelt. 20. Dr. J. Beach. 57. Depot, L. V. R. R. 21. Edward Gaston. 58. Mrs. Mary H. Bartholomew. 22. E. Snyder. 59. T. Rhodes. 23. C. Bartholomew. 60. Freeman Bros. 24. Mrs. Davenport. 61. J. Bartholomew. 25. E. Freeman. 62. 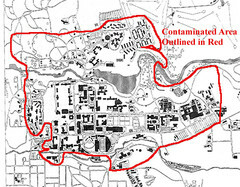 S. Ralph Estate. 26. L. Hemmingway, shop. 63. Milo Snyder. 27. L. Hemmingway. 64. Emma Snyder. 28. D. B. Conklin. 65. Mrs. Hurley. 29. Mrs. John Reed. 66. Etna Creamery. 30. Barbara Rulison. 67. Blacksmith Shop. 31. Arthur Burr. 68. Machine Shop. 32. P. Brady. 69. Hannah Lee Estate. 33. Smith Stevens. 70. Wm. 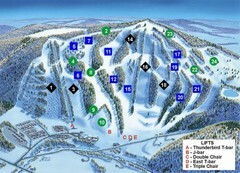 H. Sherwood 34. D. Brotherton. 71. Geo. H. Houtz, Store. 35. Cabinet Shop. 72. Mary H. Bartholomew. 36. Wagon Shop. 73. Mrs. G. B. Davis. 37. Blacksmith Shop. 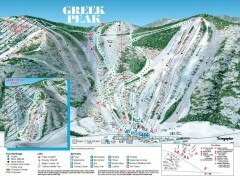 Trail map from Greek Peak Ski Resort. 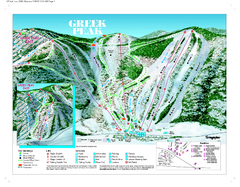 Trail map from Song Mountain.